Jack Withington rides in a group of other motorcyclist into the Alfredo Gonzalez State Veterans Home Wednesday, March 14, 2018, in McAllen. 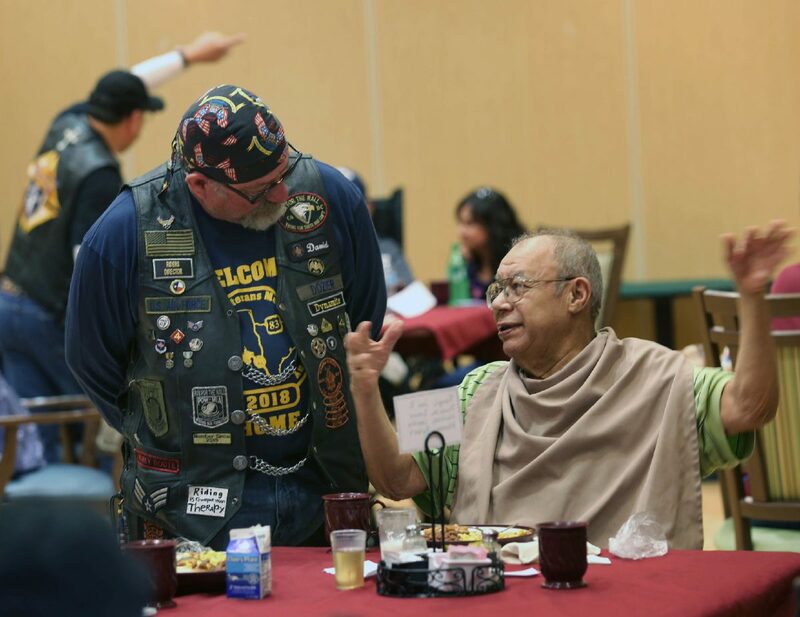 McALLEN — Before their last stop in Brownsville, over 40 motorcyclists visited the Alfredo Gonzalez Texas State Veterans Home for their annual celebration of service members. 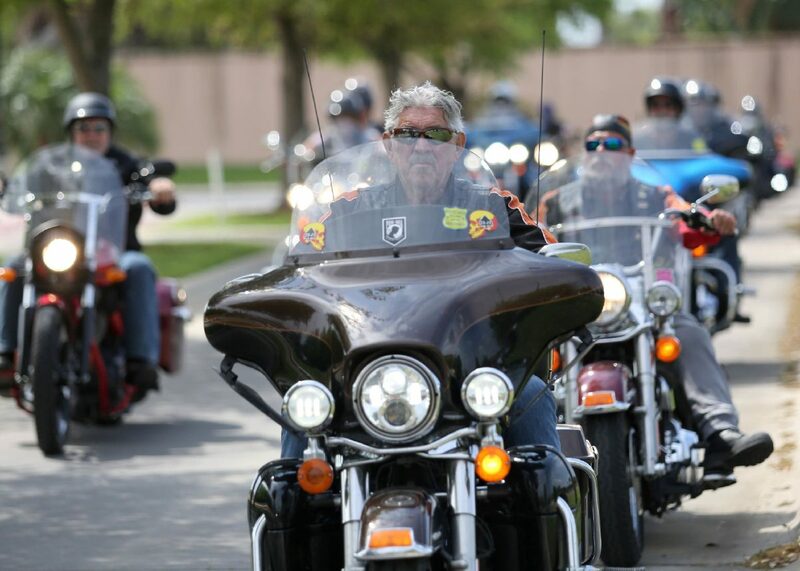 The participants began their pilgrimage in Perryton, Texas, and rode the entire length of the state on U.S. Highway 83 to commemorate the highway’s designation as the Texas Vietnam Veterans Memorial Highway. Gene Smith of Spearman, Texas, has made the trip for 13 years. He was joined by his wife, Rhonda Smith and his son, Koree Smith. Koree Smith, 20, first made the trip on the back of his dad’s motorcycle at age 6. At 15, he became the youngest rider to make the trip on his own bike, and now commands the ride alongside his father. 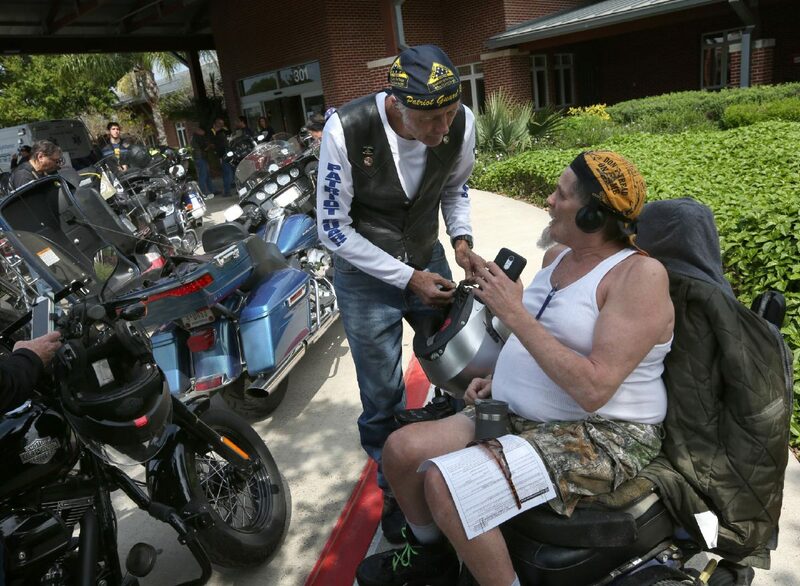 Cliff Perry, center, talks with Alfredo Gonzalez State Veterans Home resident David Hughes after a group of motorcycle riders stopped by the home to visit veterans Wednesday, March 14, 2018, in McAllen. The motorcycle riders were traveling the length of U.S. 83, which also known as the Texas Vietnam Veterans Memorial Highway. The group started their 3-day, 895-mile ride on Monday in the Texas panhandle and finished Wednesday in Brownsville. David Dozier, left, talks with Alfredo Gonzalez State Veterans Home resident Jose Rangel while visiting the home on Wednesday, March 14, 2018, in McAllen. Dozier rode his motorcycle down from the Texas panhandle to commemorate the anniversary of U.S. 83 being known as the Texas Vietnam Veterans Memorial Highway. The 36-hour ride has to be neatly organized, Rhonda Smith said. There are about 10 “road guards” in front wearing reflective blazers who direct the group, while Rhonda Smith and another participant — or the “pickup girls,” as they call themselves — ride in a support vehicle. Once they arrived in McAllen (at about noon) they joined the roughly 160 veterans that reside at the Alfredo Gonzalez Texas State Veterans Home for special lunch of barbecue. In front of the dining hall where they ate, there’s a plaque honoring one of their most-decorated residents: Gordan Jenkins, or “Pappy,” as most of the residents refer to him. The 97-year-old veteran served in four wars, and has 14 medals weighing down his plaque to show for it. Jenkins joined the Navy on July 2, 1941, when he was “just old enough to get in.” Though, he admits he may have stretched the truth when enlisting so he would be eligible to join. Due to family complications, he made a brief hiatus as a civilian. After having difficulty finding steady employment, “Uncle Sam called (him) back for duty” in 1968. But a life of service didn’t come without its share of sacrifice and events like Wednesday’s remind him and he and the other residents are appreciated. “They do good work for us,” Jenkins said.